You can now transfer your SBI Account to another branch online. Yes, online account transfer facility is now available on SBI Internet Banking. Now you can transfer your SBI Account to any branch in just 1 minute, no need to visit the bank. There may be several reasons for transferring your account to another branch. For example, your current branch is quite far away, your current branch staff behavior not good, you have shifted to another place and so on. If you also have SBI Internet Banking facility and want to transfer your account to another SBI branch, follow this guide, and transfer your account online in just 1 minute. Assume, you have SBI net banking facility. Ok then, let’s see how to transfer SBI account to another branch online through net banking. 1 First of all visit Internet Banking portal and login to your account. 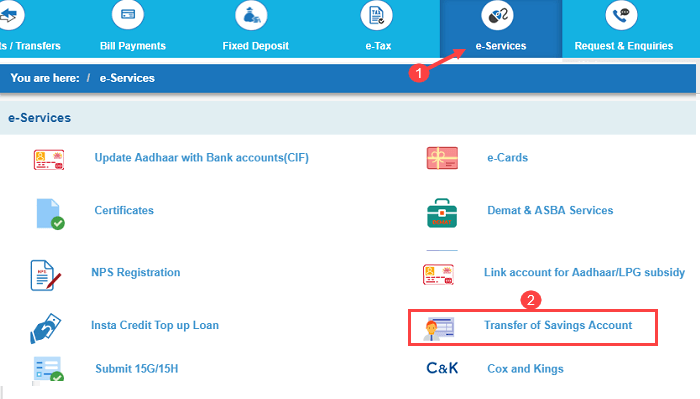 2 After logging in to your Internet Banking account, you have to click on e-Services as you can see in the screenshot below and then click on Transfer of Saving Account. 3 Next screen check your request details and everything is correct then click on Confirm. 4 Now you will receive High-Security password (OTP) on your registered mobile number, enter OTP password and submit. Congrats, your SBI Account Transfer Request Successfully submitted. How much time it will take to complete Request? Within just 1 week, your bank account will be transferred to your new branch. I have also transferred my account online to my nearest branch, which has been successfully transferred in 5 days. How do I know that the account has been transferred? It is very easy. If you see your online e-statement, you can see your new branch name. Click My Accounts – View statement. Also, you can see your new branch name mentioned in My Account’s Branch tab. Do I need to visit my new branch? Yes, to collect the new passbook you need to visit your new branch. Also, confirm that account transferred successfully or not. You can visit anytime. So this is how you can transfer your SBI Account to another branch online through Internet banking. No need to visit bank, SBI Change Branch facility now online! I have missed out my internet banking cover how can i transfer my account from one branch to another branch is this possible to transfer please suggest me. Hello after transferring account to new city..Did they need address proof of that area…If I ask for new atm card online after changing the branch..At which address they will deliver..Can you clarify more..
Can I transfer my account​ from Rourkela to Patna using the above mentioned online procedure?Do reply. After request you can’t cancel it. But don’t worry after 180 days you can change once again. Thanks Team for Sharing this Valuable information, everybody please note that This facility is available between 08:00 HRS IST to 20:00 HRS IST. Is there a way I can transfer my ppf account as well online? If account is a salary account then does it create problem in salary credit from employer? I have an PPF account with SBI and it linked to my saving account. Is there any way to transfer my PPF account from one branch to another branch online? Currently Saving account transfer facility available online. To transfer PPF account you need to visit bank. 1. I am from Haryana and working in Madhya Pradesh. And going to transfer a/c from Haryana to Madhya Pradesh. As you told, I will do this through online mode. But I don’t have any address proof documents of Madhya Pradesh. What should I do in that case..? 2. Are there any service charges / hidden charges for this.? 3. My old passbook / ATM will work or not.? 1: State to state account transfer require address proof. Plz ask SBI CC for more details. 2: Account transfer charges applicable. I have FD apart from SB account. Will it also be transferred simultaneously along with my SB account ?? Yes it will also transferred. You can manage it through net banking. After transfer to get new pass book, charged for this? Hi , Once the Branch is changed, naturally the IFSC code will change. Should i ask my employer to update his employee details (IFSC Code). The reason why I am asking this is because, he use to transfer my salary in my bank account. Hi, Sir I am a sbi customer. I wish transfer my account in my nearest branch. I used the online system. Then I registration successfuly.But password is invalid see this message. Then I used forget password. I Submit all document. But then said invalid ID….Now what can I do?? ?plz tall.plz ans my questions…. 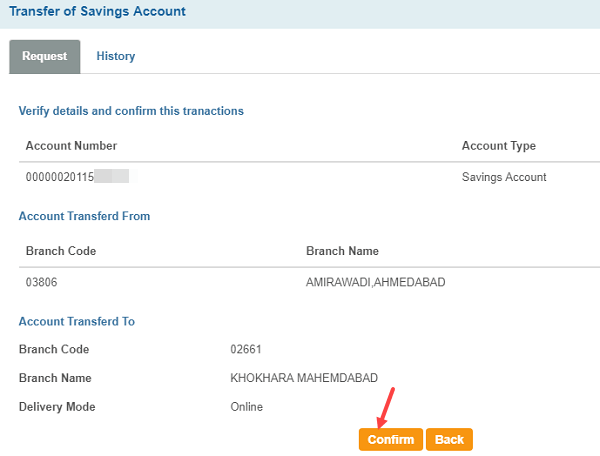 Is it possible only for savings account or One can also change the location for current account? Please provide info. By the time you reply I might have done it for myself being in the situation but your reply could help others! This facility available for savings account only. First Register your Phone number to access online services. Visit bank and register your mobile number. No. Net banking works with same user ID. if accont is transfred. need to change cheque book also. No need to change cheque book. How can I transfer my SBI joint account to other branch? Follow same process if you have net banking facility. OR just visit your new branch and fill transfer account form. i missed my PPk ket number ,how can get back it? 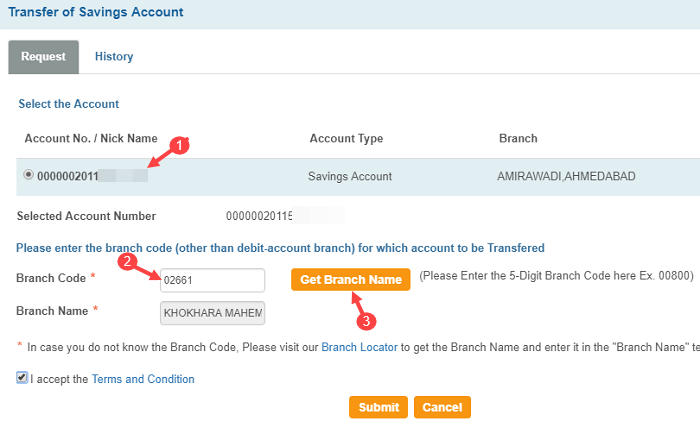 I don’t see any option for transferring a NRE account from one branch to another. When approached both the branches, none of them were helpful to transfer the accounts. This is different thing. Kindly meet Branch manager. CIF problem facing this…online change branch option saying branch manager SBI .. Recently I have transfered My A/c from SBI 11645 kavathe mahankal to 06611 military cantt branch, but my CIF code is not been transfered; so I am not able to properly operate my account. I have sent request to 11645 kavathe mahankal several times but yet they are unable to do so. Please look into my request and do the needfull. 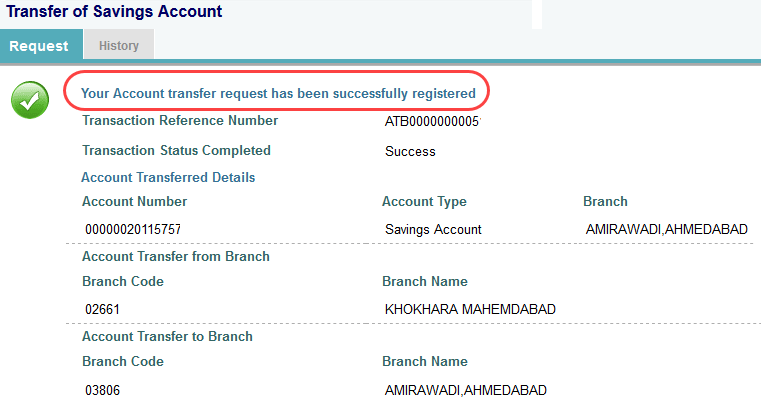 I have successfully done transfer of my SaVING ACCOUNT online but in Account summary page it is still showing the old branch name. Is it take some time to reflect the changes or its done immediately? Now can I go to the new branch for my address change? Please confirm. please wait for 1 week. You can transfer account only one time within six month. After six month you can transfer your account again. I have transferred my account but it is still showing old branch even after two months. When visit old branch they are saying that the branch is changed. How much time it takes for complete transfer. Shall I need to do it again or it shall be done automatically. I’m trying to transfer my SBI account from Model Town, Denhi to Dwarka, Delhi but every time it’s ending up with an error saying “Please try again”. Not sure what’s an issue but doe anyone know about it? Thanks!! Hello this is temporary. Try later. During transition period ,that is from my request time & execution of of account transfer ,mu ATM CARD,My net Banking Facility ,& my cheque books will be operational or not please confirm.